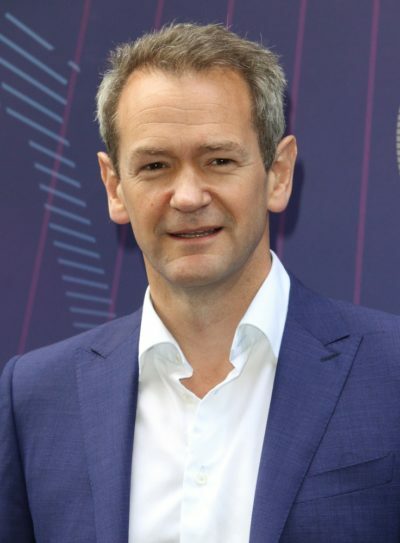 Place of Birth: Rothbury, Northumberland North Second, Northumberland, England, U.K.
Alexander Armstrong is an English comedian, actor, television presenter, and singer. He is one half of the comedy duo Armstrong and Miller, alongside Ben Miller. Alexander is the son of Emma Virginia Peronnet Thompson-McCausland and Henry Angus Armstrong, a physician. He is married to Hannah Bronwen Snow, with whom he has four children. Alexander’s paternal grandfather was Reginald Armstrong (the son of Henry Armstrong and Maud Clapham). Henry was the son of Henry Armstrong and Elizabeth Burnett. Maud was the daughter of Henry Clapham and Esther Mary Watson. Alexander’s paternal grandmother was Phyllis Alison Fenwick (the daughter of James Charles Fenwick and Margaret Beatrice Wilson). James was the son of John Charles James Fenwick and Frances Eleanor Burrell. Margaret was the daughter of William Wilson and Margaret Dawson. Alexander’s maternal grandfather was Lucius Perronet Thompson-McCausland (the son of John Perronet Thompson and Ada Lucia Tyrrell). John was the son of Vincent Thomas Thompson and Eleanor Wade. Ada was the daughter of Irish parents, Robert Yelverton Tyrrell and Ada Shaw. Alexander’s maternal grandmother was Helen Laura McCausland (the daughter of Maurice Marcus McCausland and Eileen Leslie Ogilby). Maurice was the son of Connolly Thomas McCausland, who was born in Ireland, to an Irish father and an English mother, and of Laura St. John. Eileen was the daughter of Robert Alexander Ogilby, who was Northern Irish, and of Helen Sarah Wheeler. Erm, anybody with a name like Henry Angus Armstrong (his dad) would, I wager, have more than a hint of Scottish in his blood. Most of Alexander’s descendants have Scottish names. The distant Scottish ancestry is from his mother’s side. There is no Scottish-born ancestor listed in his father’s genealogy. But given some of the names, like Armstrong, and the fact that almost all his paternal ancestors were from Northumberland, it is possible his father too has some. But it doesn’t seem like it is a big component of his ancestry.